Personal Power Zones are a way to earn more as a driver by finding high demand areas and scoring a bonus on your next ride. Once a Personal Power Zone bonus starts accruing, you’re guaranteed that amount after your next ride as long as you complete it before leaving Driver Mode. Heads up: Personal Power Zones will replace Prime Time on your map for a more consistent experience. With Personal Power Zones, you’ll see the actual amount of the bonus earned, not a percentage. Personal Power Zones appear when there’s high demand nearby, making it easy to see exactly where you’ll earn bonuses. These zones are based on your location, so you won’t have to drive across town to find your next ride and your next bonus. Heads up: During times with less rider demand, you may not see a Personal Power Zone. When there’s no Personal Power Zone nearby, you’ll see a map of where demand is trending all over town. Drive into the purple zone to guarantee a bonus on your next ride. Drive into the pink zone to guarantee an even bigger bonus. The longer you stay in the pink zone, the bigger your bonus gets. Give a ride to get your bonus. Once you've gotten a bonus guarantee, stay online and accept your next request. You'll earn the bonus when you complete that ride. You’ll also earn a bonus if your rider is in one of the zones when you accept the ride, even if you’re not in the zone. Note: If you accrue a Personal Power Zone bonus but exit Driver Mode before you give a ride, you'll be ineligible for that bonus the next time you enter Driver Mode. What happens if I’m driving toward a Personal Power Zone but get a ride before I reach it? If your rider is in the zone, you’ll be eligible for a bonus as soon as you accept the ride. If your rider is outside the zone, you won’t be eligible for the bonus. I know it’s busy out there, but I don’t see anything on my map. Personal Power Zones show you bonus areas that are within a short driving distance from you. If you don’t see a Personal Power Zone near you, drive toward a yellow or orange area shown on the map. These areas indicate higher ride demand, but do not indicate a bonus. Your map will continue to update as you drive. Why do other drivers see different demand zones? Your Personal Power Zone is based on demand near you. Drivers in other parts of town will see the demand that matches their location. Will the bonus amount stay the same if I complete a ride with a high fare? The bonus you see in the app is the bonus you get. However, if demand is much higher than normal or your trip is longer than usual, we’ll boost your bonus. If we do so, you’ll see the new bonus amount on your ride receipt. What if I drive for other modes like Lyft XL or Lux? 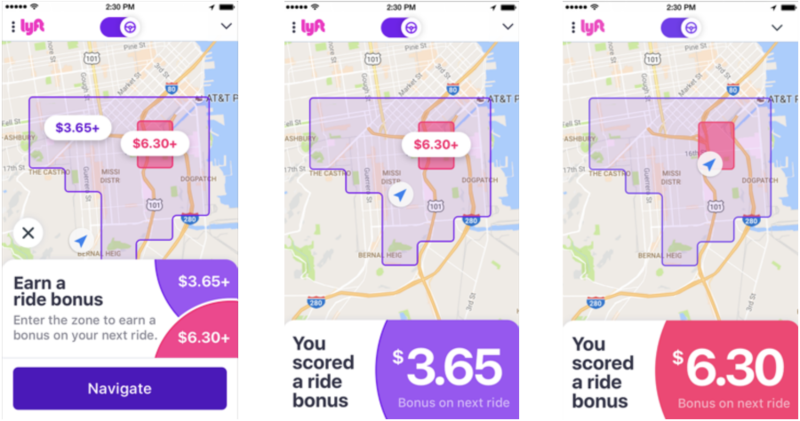 If you’re driving with XL or Lux, the bonuses you see will be higher than bonuses for standard Lyft rides.